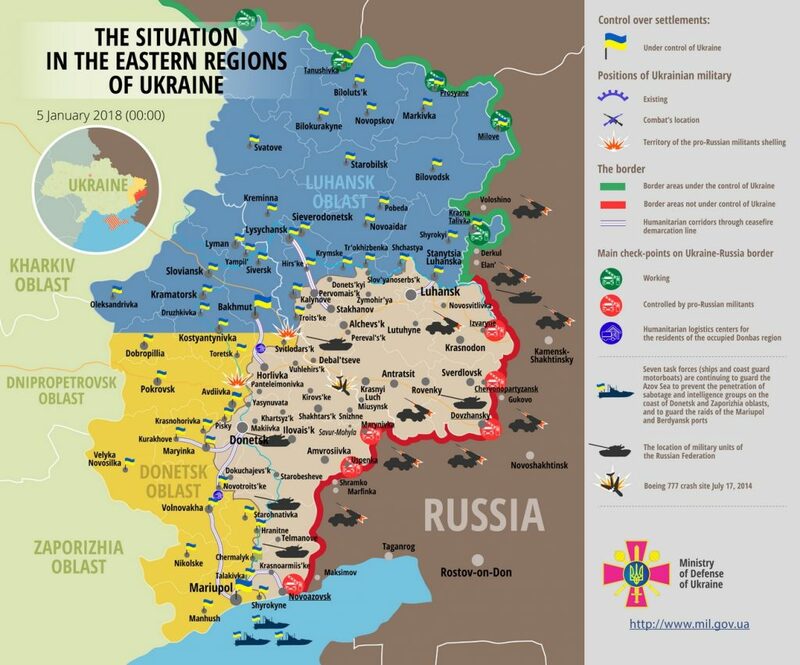 Russia-backed militants committed two precision attacks in eastern Ukraine yesterday using Minsk-proscribed mortars, reported Ukrainian Ministry of Defense spokesman on ATO Colonel Maksym Prauta at a press briefing at Ukraine Crisis Media Center. In Luhansk sector, the militants violated the ceasefire for the first time in the past three days. “Late in the evening militants fired thirteen 120-mm mortar rounds against Ukrainian positions near Luhanske,” elaborated the spokesman. In Donetsk sector, Russian proxies delivered a 40-minute attack against Ukrainian positions near Verhniotoretske using small arms and grenade launchers and fired three 120-mm mortar rounds. Ukrainian troops did not return fire. Unfortunately, one Ukrainian serviceman was wounded near Svitlodarsk. Report on the military developments as of January 4 is available here. Interactive data on the shelling: chronology shelling chart and the interactive map.